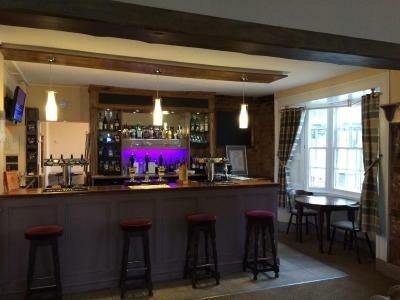 Lock in a great price for The Chase Inn - rated 8.6 by recent guests. The breakfast was delicious and the owners were lovely. Nothing was too much trouble for the staff they were very accommodating. Everyone was very friendly and talkative. They showed an interest in myself and my dog. Very, very clean. Terrfic value for money. Reasonable choice for breakfast - breakfast waitress friendly & helpful. Very friendly staff and fantastic food. Also very well priced. Pleasant and large family room with excellent shower. Great friendly pub serving exelant food. Room was clean with everything we needed. Exelant value for money would deffonatntly recommend. The staff and Inn were welcoming and friendly and made us feel at home. The location was lovely, with views and outside (seating) overlooking the village green. The breakfast was good, perfect poached eggs. location for our purpose was excellent, facilities and friendliness also excellent. As we were both vegetarian, I phoned ahead to ask if a vegetarian breakfast could be made available, which it was, and again was excellent, as was our 2 evening meals. Set within the picturesque country village of Bishop’s Frome, this bed and breakfast serves award-winning real ales in its pub. Free private parking is provided and each en suite room has free Wi-Fi access. Guests can also relax in the rear garden. 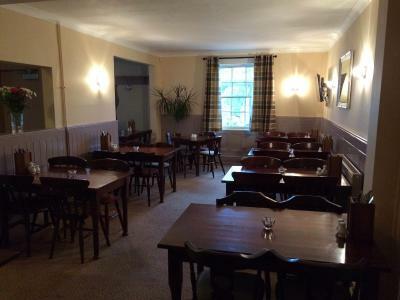 The Chase Inn offers a full English breakfast and has a charming restaurant with a village menu, specials board and homemade desserts served all day. In the colder months, you can relax by the open fireplace after your meal, or enjoy a game of darts or pool in the bar area. Guests can also watch live sporting events on Sky Sports channels. There are many pleasant walks and charming scenery to take in nearby and the Chase Inn admits dogs free of charge. The market town of Ledbury is also 15 minutes’ drive away. You can reach Hereford and Worcester by car in 25 minutes, while the M5 motorway is less than 30 minutes’ drive away. This property also has one of the best-rated locations in Bishops Frome! Guests are happier about it compared to other properties in the area. This property is also rated for the best value in Bishops Frome! Guests are getting more for their money when compared to other properties in this city. 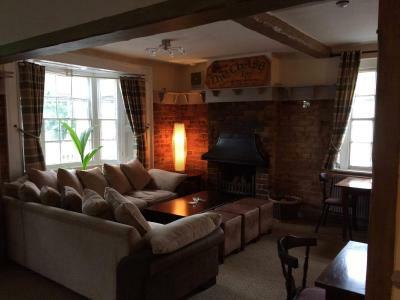 The Chase Inn has been welcoming Booking.com guests since 9 Feb 2012. When would you like to stay at The Chase Inn? A bright en suite room with free Wi-Fi access, a TV and tea and coffee making facilities. An en suite room with free Wi-Fi access, a TV and tea and coffee making facilities. House rules The Chase Inn takes special requests - add in the next step! The Chase Inn accepts these cards and reserves the right to temporarily hold an amount prior to arrival. Please note that The Chase Inn holds a late license until 01:00 and therefore it can be noisy at the weekend. The restaurant is open from 12:00 until 15:00, and 18:00 until 21:00, Monday - Saturday. It is open from 12:00 until 18:00 on Sundays. The country roads. On a par with Devon roads.no dislikes with the people or building. The food very good. The staff very helpful. Very clean. The night time staff were a bit rude, our friend had no toilet seat in her room and had to keep reminding the staff. She finally got one fitted on our final night. The ensuite was just a shower...no bath. The food was a bit disappointing. Not as good value for money as everything else. Room smelt strongly of cigarettes. Very friendly to dogs and food was good. My room was above the outside allocated smoking area, so smoke came in through the bathroom. Bedroom and bathroom facilities were poor, but bed mattresses were good! It was warm upstairs and clean. Awful pillows, no 'give' in them. Tiny en-suite & shower. Very few places to put anything (make-up etc). The bathroom in the single room was the smallest I’ve ever been in. Take note if you are a more larger sized person.